I came home today to find a large envelope smooshed into my mail box (I sometimes think my postal carrier has it in for me). I was so excited, because I knew what it was! SOCKS!!!!! Socks that have come all the way across the US. 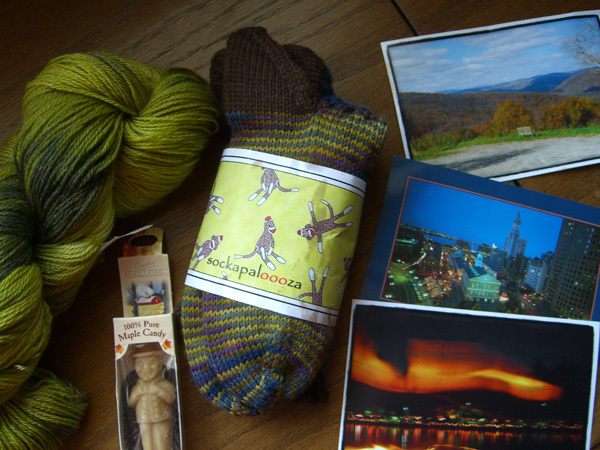 And look at all these cool things that my pal, Kat, sent! There are postcards and pictures from her area of the country. And a beautiful hand dyed merino/tencel sock yarn from Mind’s Eye Yarns in absolutely my favorite shades of my favorite color, green! And what’s that down there towards the bottom? Could that be… maple candy? Oh, Kat, how did you know that I will kill for that stuff! There were also a couple of candies that unfortunately didn’t survive our mini-heat-wave of the last couple of days (ok… mild warm spring weather). And a candy bar that I have put in the fridge where it will hopefully solidify. And cookies that unfortunately didn’t survive my mail carrier smooshing the package into my mail box (darn him/her!). I ate them anyway. 😛 Nothing wrong with cookie crumbs. And here you can see the lovely socks on my happy, happy feet. They fit perfectly! I love the way the colors spiraled. It’s hard to tell from this pic, but the spirals actually continue from one leg to the other. Very cool. 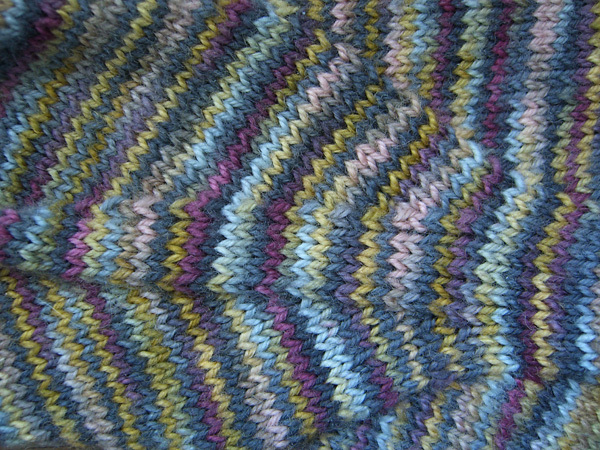 This is Artyarns Supermerino. I’ve been wanting to get a good look at this yarn, and now I have some! Thank you, Kat! These were well worth the wait! I shot this pic last Thursday from a parking structure downtown. We don’t see the sun that often this time of year. It had been soggy all week, and then the sun broke through on the west side, although it was still raining to the east. 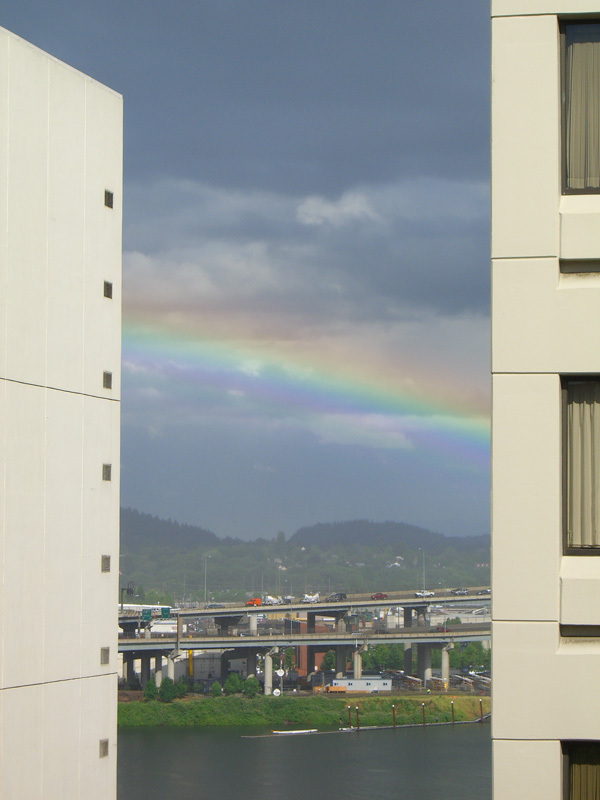 And there between the buildings was a rainbow. Do click on the picture to see the bigger version. It’s Rose Festival now, or will be starting in a few days. We are, therefore, guaranteed rain for at least the next couple of weeks. But today the sun is shining, and ya gotta love it. I hope everyone had a nice holiday! I had a very quiet holiday, although I did see a few friends. #1 Son is in and out and not much in evidence. He’s trying to get everything ready for the next tour, different band, starting soon. This is what I worked on during the weekend. It’s a super-secret project. One of those just gotta try it, but will never admit it if it doesn’t work projects. So the picture is just a hint. I think it’s going to work. No progress on any other project. 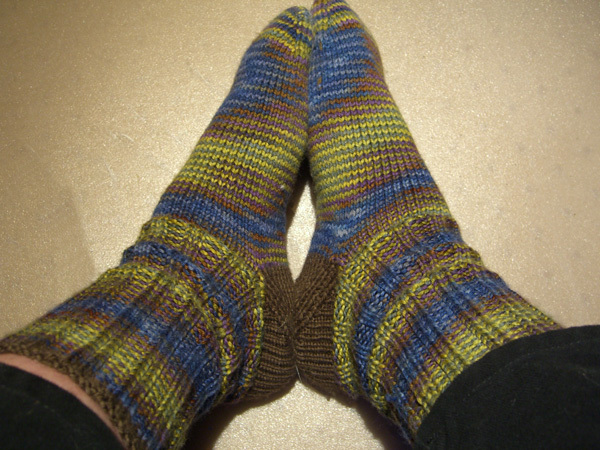 In fact, you can see that I haven’t even managed to get the page up for the Tipsy Knitter socks. It was a lazy weekend. I need one of those every now and then.